On our last full day in New York, we went down to the Financial District and to Chelsea to check out the High Line and Chelsea Market. Before starting our walk through the Financial District we stopped by the 9/11 Memorial 9/11 Memorial. It’s easy to spot the One World Trade Center building from afar, so we didn’t have any trouble finding the memorial, even though there was a bunch of construction in the area. We walked past the museum (will go through it on another trip), got a peek of the Oculus but couldn’t really see the whole thing from where we were. 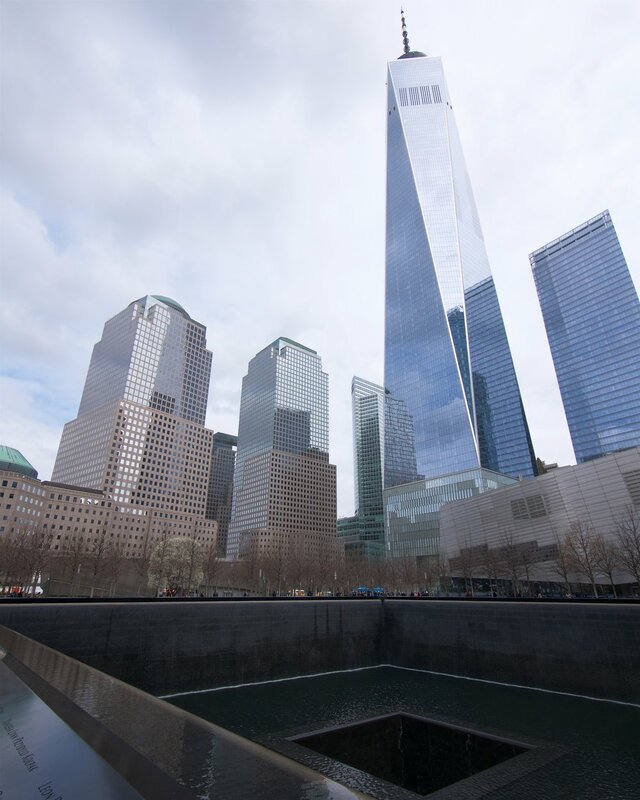 Since there weren’t a lot of people milling around, we had no trouble going right up to the two memorial pools which mark the footprints of the twin towers. Some of the names had roses on them, representing the victims’ birthdays. Across the street, we took a closer look at The Sphere by Fritz Koenig which was recovered from the towers’ rubble. It sits in its original location. It was a walk of a few blocks to the start of our Financial District Walking Tour. First stop was the statues Charging Bull by Arturo Di Modica and Fearless Girl by Kristen Visbalat, both at the north end of Bowling Green. The bull is iconic, with a stream of people taking pictures with it. There was no time without one or two people posing at the bull’s head. The same seemed to be true of the bull’s rear, too. 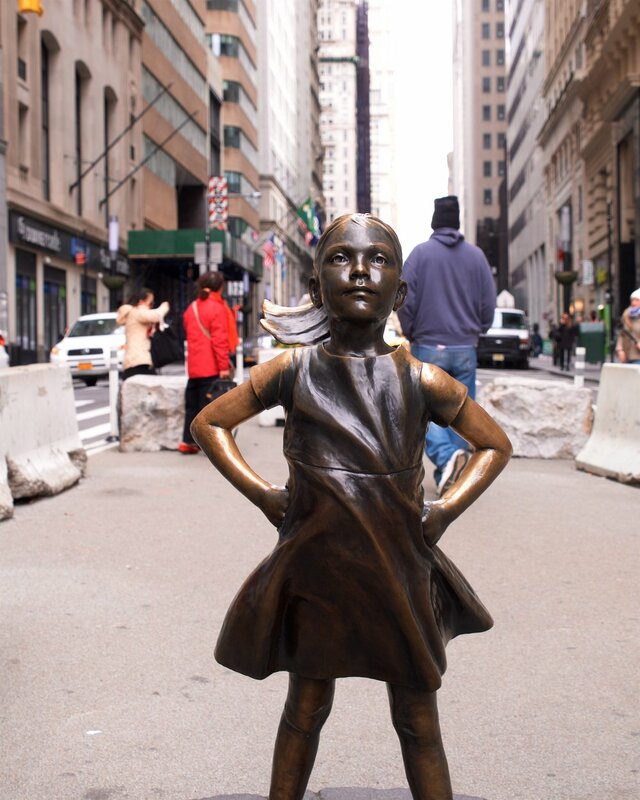 There were about as many people taking photos with Fearless Girl, many striking the same pose with arms akimbo. Mostly women. The Alexander Hamilton U.S. Custom House sits at the other end of Bowling Green. The U.S. Customs Service is the country’s oldest federal agency, having been established by the First Constitutional Congress. The current Beaux Arts building isn’t the first for the agency, having been completed in 1907. The oval rotunda has a skylight at its center, surrounded by several fresco paintings. It is the home of the National Museum of the American Indian. After taking a quick look at the Fraunces Tavern Museum then proceeded to Stone Street, which is now a cobblestone pedestrian-only street. We knew that Financier Patisserie was there and we stopped by for a pastry and also got a cookie for later. The Federal Reserve Bank of New York is huge, taking up an irregular block. 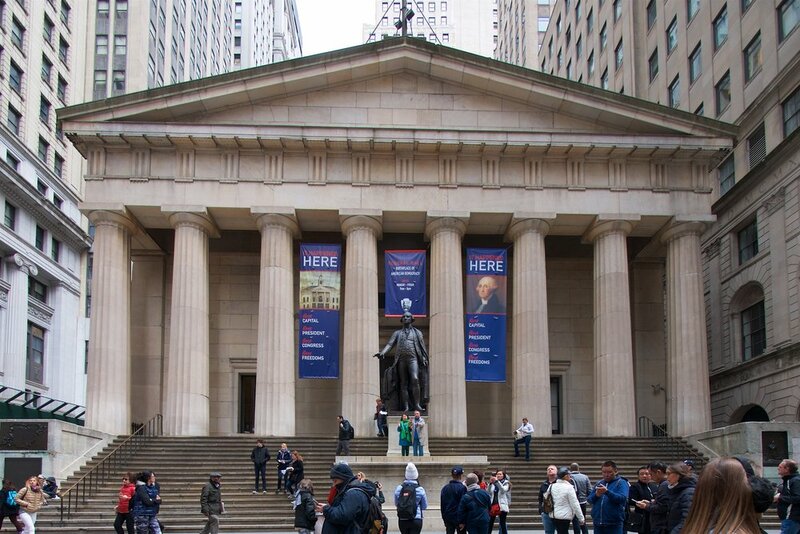 After that, we were on Wall Street, looking up at 23 Wall Street (Formerly owned by J.P. Morgan & Co.), 40 Wall Street (the Trump Building, originally the Bank of Manhattan Trust Building), the Federal Hall National Memorial (where George Washington took the oath of office and original home to the three branches of the new government), and the The New York Stock Exchange. Our last stop was at Trinity Church. The photo only shows the side with the spire, but the Church is pretty deep. 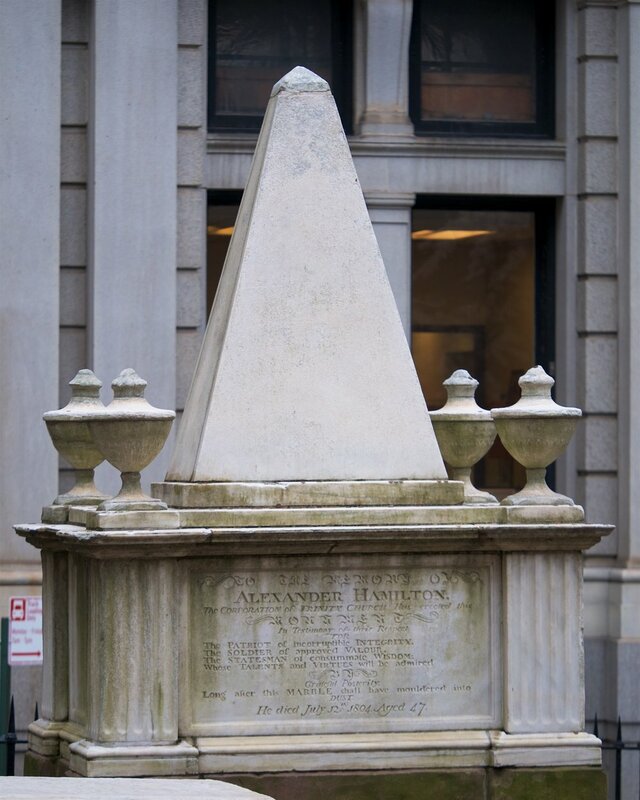 The churchyard is where Alexander Hamilton and Robert Fulton are buried. It was about lunchtime, so we got a quick bite from a café then went back to our hostel to relax a bit. 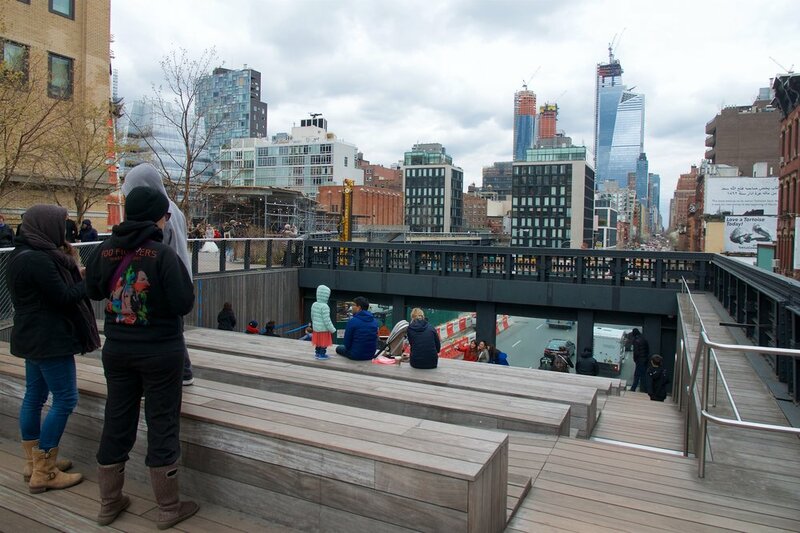 We had already planned to meet Celeste after she was done with work, so we headed to The High Line, a former New York Central Railroad spur which was converted to an elevated park. They did a really good job with putting in various elements; you see repeating motifs with exposed rail, grass, trees, and sculpted concrete, but they also have area-specific features, such as a section that looks like huge chaise lounge benches or another with a big window looking down 10th Avenue. It was pretty cold and windy being exposed so high up, so we stopped about a third of the way through and went to Chelsea Market. The Chelsea Market in the Meatpacking District used to be the factory for the National Biscuit Company, now known as Nabisco. It's now an arcade with mostly food stores. We decided to have crepes for dinner, figuring that two would be enough for the three of us. The way they were served, the intent was for them to be held and eaten; we settled on taking a bite and passing to the next person, so we each alternated between spinach and mushroom/avocado crepes. We were entertained and wondered if the people around us were, too. While there was a mini donut shop next to us as we ate dinner, we went to a chocolate shop for dessert. The seating there was next to some shovel heads which were decoratively cut out, which made interesting patterns. Having finished dessert, it was time to head to the subway and bid farewell to Celeste. We had a great trip, a lot due to being able to spend so much time with her. It was sad to say goodbye, but we'll see her later this year when she comes to visit.